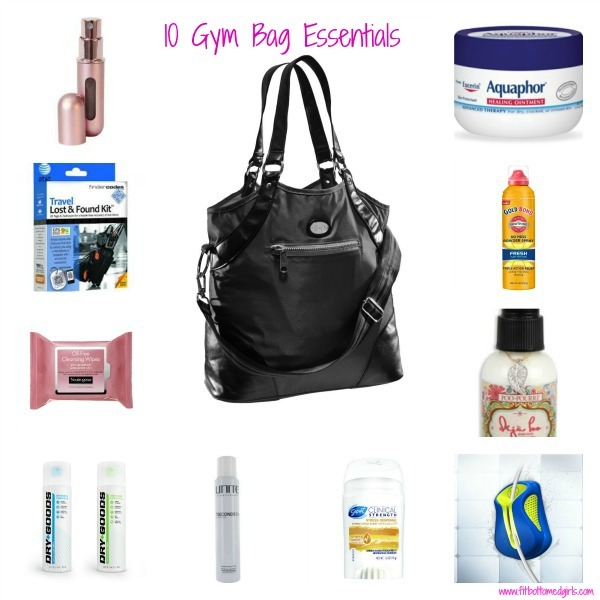 10 Gym Bag Essentials---And One Really Cute Gym Bag! 10 Gym Bag Essentials—And One Really Cute Gym Bag! What’s in your gym bag these days? Here’s what’s stuffed in ours, which just happens to be the super-cute Women’s Under Armour Must Have Bag ($50). It has enough space to go from weekday workout to a weekend away with a removable strap that transforms it from a nice-looking shoulder purse to a highly functional messenger bag. We heart. And we’ve filled ours up with these gym bag essentials! 1. Travalo. Love perfume but are afraid to throw it in your gym bag for fear of it spilling everywhere? Travalo ($10) is a refillable perfume “atomizer” that keeps your good-smelling scents safe—and separate from the rest of your stuff. 2. FinderCodes. To make sure your precious workout essentials—water bottle, gym bag, headphones, track jacket, iPod—aren’t lost, equip each with a FinderCodes tag ($33 for a multi-pack). These durable stickers can be attached to virtually any surface, so in case you do lose something, any Good Samaritan gym-goer with a smartphone can get you your valuables back. 3. Neutrogena Pink Grapefruit Cleansing Wipes. You know we love Neutrogena, and these Oil-Free Cleansing Wipes ($7) are soft and thoroughly cleanse your skin, all with an invigorating blast of pink grapefruit. Oil-free and ideal for acne-prone skin, the wipes sweep away pore-clogging dirt and oil in one simple step, leaving skin clean with no greasy residue, so there’s no need to rinse! 4. Dry Goods. Say goodbye to chafing with Dry Goods ($15), an athletic spray powder. Use it on your underarms, feet or around your sports bra to keep skin dry when you work out. It’s a life-saver! 5. Unite 7 Seconds Dry Shampoo. If you don’t have time for a full shower with wash and blow-dry post-gym, try Unite 7 Seconds Dry Shampoo ($27) that removes excess oil, increases volume and refreshes your hair without any visible powder. Perfect for those lunch-time workouts or when you’re rushing from the gym to an appointment—or happy hour. 6. Secret Clinical Strength Stress Response. Who’s not stressed these days? Secret Clinical Strength Stress Response ($7) has odor-neutralizing molecules that trap and neutralize odor from stress sweat, then replace it with a fresh scent to keep you smelling clean. Oh, and it also works fab in a workout. 7. Klingg Magnetic Earphone Cord Holder. Do the cords from your earbuds get in the way of your workouts? Keep your arms moving freely with Klingg ($20), a wearable magnetic earphone-cord holder that solves the age-old problem of earphone cables getting in the way. And when your cables are not in use, the earbuds can be magnetized to the sides of the Klingg for storage. Sah-weet. 8. Poo-Pourri. No one likes a stinky locker room. But sometimes, you gotta go—especially before you work out. Which is why Poo-Pourri’s sprays ($25) are a gym bag essential. Just spritz the toilet bowl before going to the bathroom, and the formula creates an odor-trapping layer across the water that neutralizes and dissolves those pesky odors. Then, simply flush! Bad smells begone! 9. Gold Bond No Mess Powder Spray. After you hop out of the gym’s shower, spray yourself down with Gold Bond No Mess Powder Spray for lasting deodorant protection and that cool, refreshing feeling. With with a light fragrance, this is the perfect cool down to your after-workout beauty routine. 10. Aquaphor Healing Ointment. Have any cracked, irritated skin or calluses from weight-lifting? Or have elbows or knees in need of moisture? Slather on a little Aquaphor Healing Ointment ($30 for two) to protect dry, cracked or irritated skin and help enhance your skin’s natural healing process. Fragrance-free, preservative-free, non-irritating, and ideal for sensitive skin, it’s also great on your lips! I was all prepared to point the thing you missed, but no – you got it all right. lol – the one thing – not a fan of the gym bag. It looks like one of those “fancy” diaper bags new moms get when they don’t want to walk around with a “real” diaper bag. I’ll have to see if my members agree!